Whatever car you drive, you might have seen AdBlue and wondered if you need it in your car. AdBlue is a chemical – made from purified and demineralised water and urea – that helps reduce the harmful emissions produced by diesel engines. If you drive a petrol-powered car, you won’t need to worry about it. Car manufacturers are using AdBlue to keep on top of ever tightening emissions targets. The most recent regulations are Euro 6 and came into force in 2016. Most diesel cars built since 2016 use a technology called selective catalytic reduction (SCR), which basically injects tiny amounts of AdBlue into the car’s exhaust gases. When this happens, and the AdBlue meets the hot exhaust, it releases ammonia, and leads to a chemical reaction which breaks down the harmful bits (nitrogen oxide and nitrogen dioxide), and produces harmless nitrogen and oxygen. Does my car use AdBlue and how do I refill AdBlue? You might not be aware if your car needs AdBlue until the warning light comes on the dashboard, but it’s a good job to check if your car is fitted with SCR technology before then. Speak to the dealer or manufacturer you’ve bought your car from, or have a look in the handbook. The AdBlue filler cap is usually beside the fuel cap, but it can be in the boot, or sometimes under the bonnet too. If you cover a lot of miles – and have a new-ish diesel car – you might have to top up your AdBlue between services. But it’s easy to do. 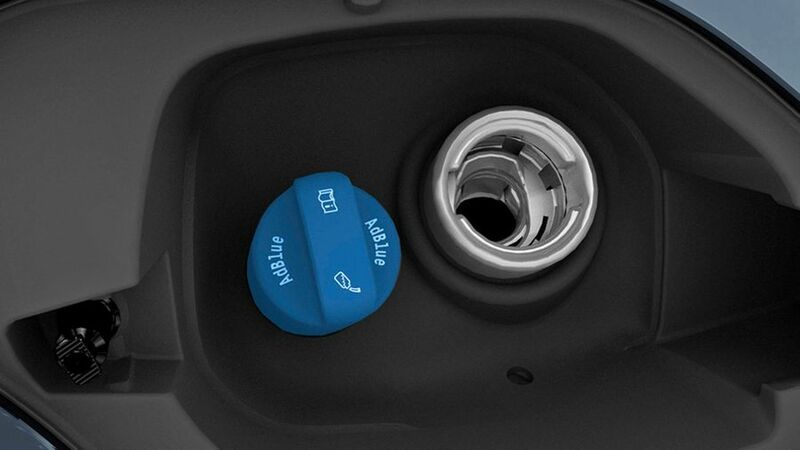 Open the AdBlue filler cap, open your bottle of AdBlue, and let it pour into the tank. Most AdBlue comes in a handy container that won’t drip. Avoid getting it on your paintwork as it will damage it, and although it’s pretty harmless to people, do wash your hands if you get any on you as it may burn. You might have to add a minimum amount when refilling to get the warning light off your dashboard – typically three to five litres. You can buy AdBlue from fuel stations, supermarkets, Halfords, Amazon and service stations. On Amazon, for example, 10-litres of AdBlue costs £10. Do note that you can’t keep a half-empty bottle of AdBlue in your garage, as things in the air will contaminate it and can change the chemical composition. Also, don’t leave it in your boot as spills or leakages will ruin your interior. If your car runs out of AdBlue completely, it won’t start. But you do get plenty of warning before that happens. Annoyingly, there’s not a magic formula to know how much and how quickly your car will use AdBlue. It depends on what car you own, your mileage, how you drive, and environmental conditions. AdBlue tank sizes also vary from model to model (typically between five and 20 litres), although most manufacturers do calculate how long an average tank of AdBlue will last. If you have fixed-price servicing, topping up AdBlue will most likely be included in this cost. But if you pay for your services individually, it may well be cheaper to top it up yourself.